The food will make you feel virtuous, but also wholly satisfied. Kale, mushrooms, black beans, and slaw make for strong vegetarian tacos. I've never felt as virtuous eating Mexican food as I have at La Capilla. That's not to say all Mexican food is heavy, cheesy, lard-accentuated taqueria fare. (For the record, I adore that stuff, too.) You can find beautiful salads and vegetable-centric mains at a host of Mexican restaurants in the East Bay — not to mention, all over Mexico — but locally, they tend to be relegated to more upscale restaurants like Comal and Calavera. It's difficult to find a similar commitment to organic ingredients and local sourcing at a spot that also sells filling burritos for $8. In addition to Obelisco in Fruitvale, now there's La Capilla. The West Berkeley restaurant opened in March near the intersection of University and San Pablo avenues. In terms of atmosphere, price, and food, it sits in between a trendy, sit-down Mexican restaurant and a bare-bones taqueria. 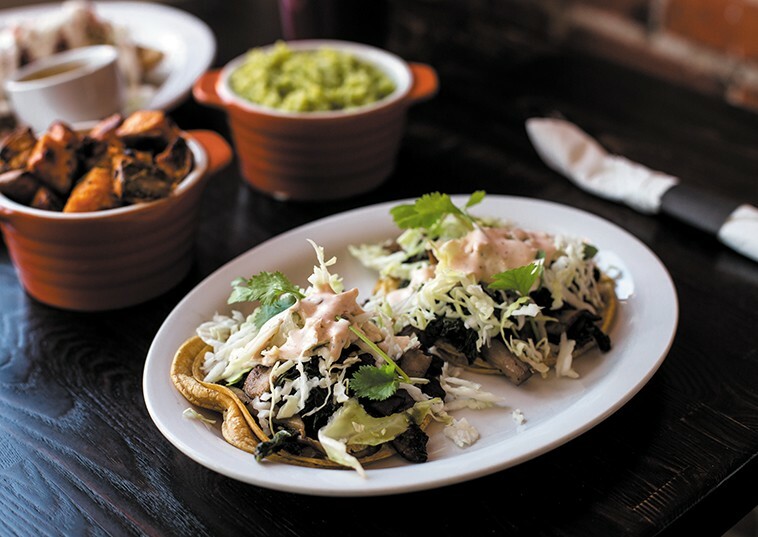 At the same time, its flavors remain traditional, simple, and unfussy, unlike Xolo or some of the more creative pop-ups gaining traction around Oakland. The space is bright and airy, with white walls, clean lines, and exposed brick. As its name suggests — "la capilla" translates to "the chapel" — religious art decorates the restaurant but doesn't feel overbearing for non-believers. The aesthetic is inspired by owner Juan Romo's childhood and, in particular, his memories of attending mass at a little chapel in Jalisco, Mexico. Romo has opened more than a dozen restaurants in the Bay Area, including Berkeley's La Mission Mexican Grill, Casa Latina Bakery, Taqueria Monte Cristo, and Taqueria Talavera. He's also working on transforming the space that held his T-Rex Restaurant & Bar into a new concept, which he'll call Calle 10. La Capilla is run by his niece Stephanie Romo. What I appreciate most about the restaurant is the wealth of vegetarian and vegan options. At most taquerias, plant-based eaters are usually relegated to tacos stuffed with pinto beans, bean-and-cheese burritos, and chile relleno. While delicious, they can get old. The deep-fried tacos are filled with smooth, creamy potatoes. 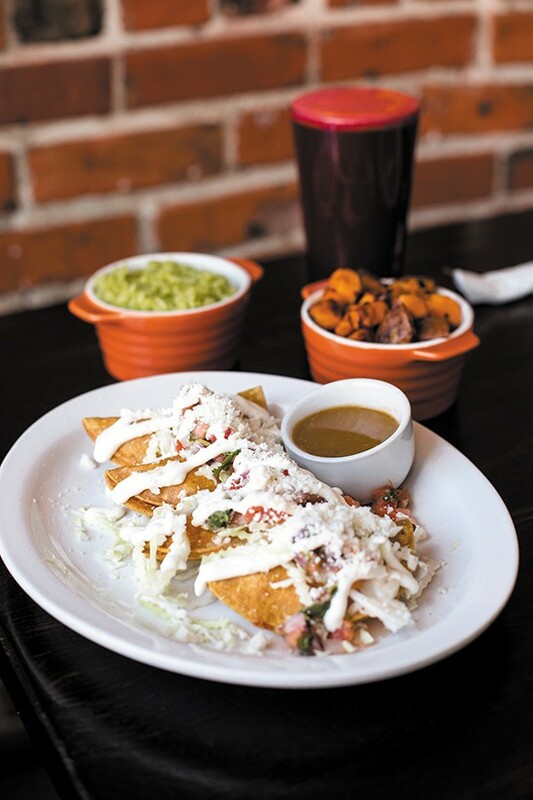 At La Capilla, vegetarians can order tacos that might look like crispy pouches filled with silky mashed potatoes and topped with sour cream, cotija, and pico de gallo, or street-sized corn tortillas smeared with smooth black beans, sliced portobellos, sautéed kale, and chipotle crema. That satisfying bean-mushroom-kale trifecta is available in burrito and sandwich form as well. With the exception of the potato tacos, all of La Capilla's vegetarian options can be made vegan. My favorite taco was the crispy, deep-fried local cod, topped with slaw, salsa roja, and chipotle crema. Next time you're craving a fish taco, skip the long lines at Cholita Linda and try La Capilla instead. The restaurant also makes a mean, 23-ingredient mole that strikes a balance between sweet, smoky, and chocolatey. You can order it topped over sweet potatoes and kale as a substantial vegetarian entrée or tossed with vegetables and rolled up in a burrito. Chicken is a mole option as well — as a plate, in tacos, or in a burrito — but since La Capilla uses chicken breasts, the result is a tad dry. Even carnivores might appreciate the opportunity to get more vegetables in with their meaty goodness. Entrée plates come with two sides of your choice, and the options include roasted sweet potatoes, sautéed kale, and caramelized plantains in addition to the usual rice and beans. You might even consider sharing a salad to start. Here, they're light and evenly dressed, such as the arugula salad with thinly sliced apples, toasted pumpkin seeds, queso, and a fruity vinaigrette. Even the burritos are lighter. I can stay productive after a La Capilla burrito, while others usually leave me exhausted. The carne asada version was wonderfully balanced, with a solid distribution of black beans, meat, cilantro-tinted rice, tangy salsa verde, and a bit of cilantro-cabbage slaw for freshness. Made with grass-fed beef, the carne asada was tender and full of unadulterated flavor. The menu gets rounded out with some egg dishes for breakfast and a few grilled sandwiches, none of which read like typical tortas. There's Swiss cheese and arugula on the chicken sandwich, and barbecue sauce on the pulled pork, which resembles crispy and fatty carnitas. That same pork stars in the Cubano, too, alongside mustard, pickles, cheese, mojo rojo, and thin slices of ham. Despite all of those ingredients, the sandwich remains nimble and clean. La Capilla also doubles as a fresh juice bar — not serving the trendy, cold-pressed, $9 kind, but freshly made and far more affordable blends of apple, carrot, beet, and kale. There are mix-and-match fruit smoothies, which, combined with a taco or two, make for an easy, clean-feeling meal. Given the popularity of fruity agua frescas, where fruit is blended with water, it's a wonder why this evolution hadn't happened sooner.